A good old staple of both British and American cuisine - where would we be without the apple pie?This sugar free version of the dish can be as simple or as complicated as you want it to be.If you like straight forward apple pie - either hot with custard or cold with cream - then you can keep it plain and delicious.Those who want to dress it up, however, can add all sorts of tasty extras, often making it seem like quite another dish altogether. 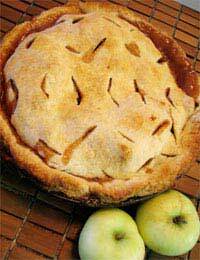 Those who prefer their pie without spices can simply leave them out in this recipe. Otherwise, add the extras and give your pudding a little zing. Place your soft margarine in a medium bowl and gently fork in one tbsp plain flour and one tbsp cold water. Mix with your fork until you have a paste. Slowly add the rest of your flour until you have a pastry-like dough. Wrap in cling film and place in the fridge to chill for about an hour. Preheat your oven to 200 deg C/400 deg F/gas mark 6. Wash and prepare your cooking apples. Peel and core the apples. Place in a large saucepan with your sultanas, cinnamon, ginger, mixed spice, apple juice and sugar free apricot jam. Stir well then heat gently, continuing to stir all the time. Allow to reach the boil then simmer gently for five minutes. Here you can substitute your plums for apricots if you choose. This is a rich pie with a strong autumnal flavour. Wash and prepare your cooking apples and plums. Peel and core the apples. Ensure you have removed all stones from your plums. Place your fruit in a large saucepan with your nutmeg, apple juice and sugar free jam. If you can find plum jam, do use it as it will enrich the flavour. Stir well then heat gently, continuing to stir all the time. Allow to reach the boil then simmer gently for five minutes. Roll out your pastry and carefully line a greased pie dish. Bake blind for five minutes before filling with your topping. Roll out the rest of your pastry. Lift and cover the fruit. Trim the edges and place in the centre of your oven. Bake for about 20 minutes or until your pastry is crusty and golden brown.